Flood Expo is taking place on the 27th & 28th of September. The Environment Agency, UN Climate Change, N.A.S.A (Disaster Prediction), The MOD, The MET Office and 220 other expert speakers and 370 suppliers are all meeting at the ExCeL, London to discuss solving some of the UK’s biggest environmental problems. You’ll have access to 14 conference halls with over 220 CPD accredited seminars, interactive debates, live demonstrations, case studies and research on everything from flood prevention to climate change – you can just drop in on the ones that you’re most interested in. 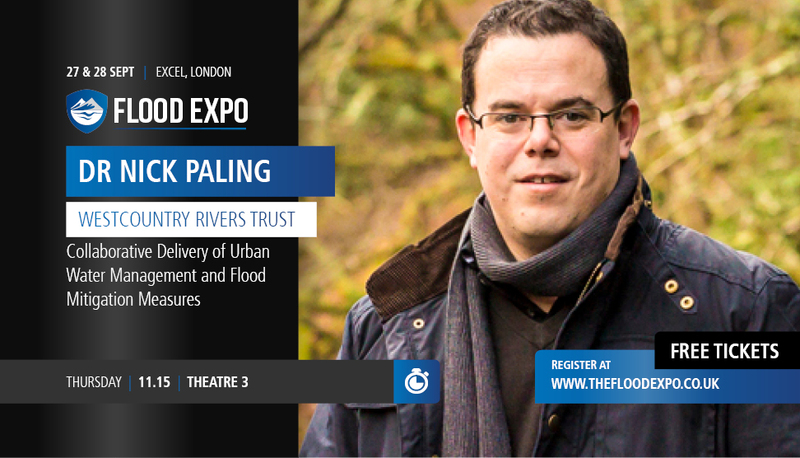 Westcountry Rivers Trust’s Nick Paling will be presenting his insights on Collaborative Delivery of Urban Water Management and Flood Mitigation Measures. There is a limited number of complementary tickets available so make sure you register here to secure one!